The free casino Cash Coaster from the company IGT is dedicated to one of the most popular attractions in the world - the roller coaster. Where each also can fight for large payments, which are calculated in different ways. This slot online is represented by five drums, on which 30 active play lines are marked, the number of which can not be changed. The rate for one spin is also fixed and amounts to 40 coins, while the value of one coin can vary and range from 1 to 50 credits. It's not difficult to calculate that the maximum bet on all lines can reach the amount of 2000 dollars. On the video slot screen, there are multi-colored sevens and various delicacies, which are traditionally sold in amusement parks: ice cream, popcorn, donuts and so on. Seven can be mixed combinations, which are paid by a separate coefficient. Wild. It appears only on the 2nd and 4th drums. Also, the wild symbol takes part in the activation of the additional Roller Coaster Wild function, for which 10 coins are additionally paid. During its activation, the 1st and 5th drum vertically on any of the spins in all positions turns into wild. As a result, successful combinations are much more efficient. Free Spins – it drops out only on three middle drums. If three of these symbols occur at the same time, the player will have to open one of the booths – so he learns the number of prize spins that will be activated in the bonus game. In the process of this game, bets are paid by the casino, the 1st and 5th drums turn into a wild-line. Bonus game gives the participant the opportunity to become the owner of the maximum prize. To do this, it is necessary that on the 1st and 5th reels there are only long Wild symbols, while one of the lines of the three remaining reels should contain 7 of a certain color. 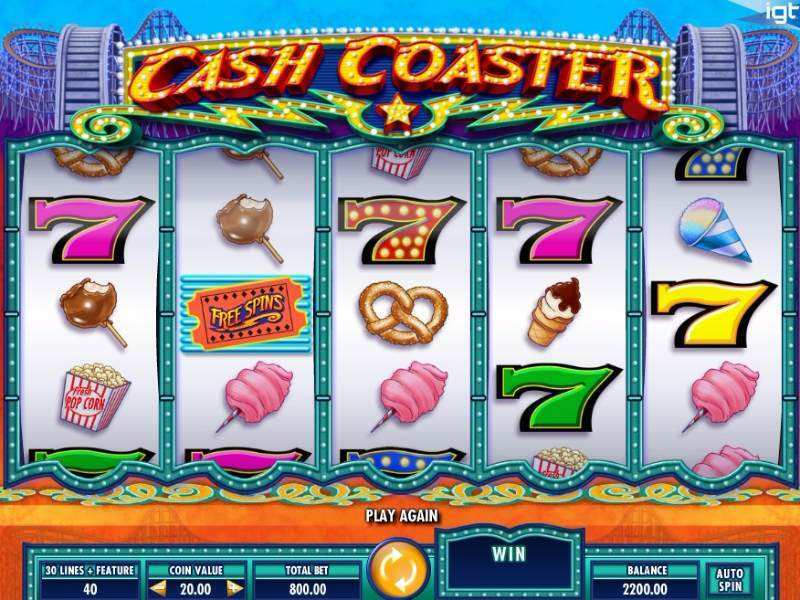 Each can bet on the Cash Coaster slots in sizes from 0.01 to 50 coins. Thanks to this, it is easy to calculate the size of the winning that occurs at the maximum multiplier of 500. As for the theoretical percentage of the return of the slot, it ranges from 91.99% to 96.06%. The value of this percentage depends on the amount of bets that the player is able to make. Profitable slot machine of IGT is available to all fans of adrenaline, where each can always feel a powerful adrenaline rush. Risking real money, each can bring a significant winning, as well as a good rest in the demo mode, putting on a “candy wrappers”. The slot will give a chance for the desired success to all who will not be afraid to put on 1-50 credits for each of the 30 active lines. By clicking on the “Start” without registration, users will play for free due to the opportunity given by this gambling online institution. There is no point in counting on the amount of the progressive jackpot, since it is not foreseen in the game. The risk-round is also not included in the list of characteristics of the machine. The advantage of the game – the presence of free spin, auto run mode and special images. 0 responses to "Cash Coaster Slot"